"Guardragon" is a series introduced in Code of the Duelist with more members in Savage Strike. This series is part of the "World Legacy" storyline. All members are Dragon monsters with different Attributes. The names of the "Guardragons" released in Savage Strike share a commonalty: the Main Deck Monsters are named after the four classic cardinal virtues, derived in Classical Greece by Plato, while the Link Monsters' names are derived from the theological virtues of Christianity. 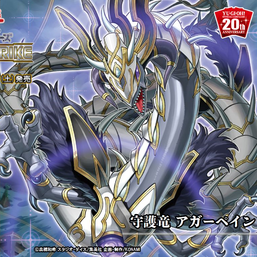 Dragon Fusion Monsters that can be summoned with "Agapain"
Dragon Synchro Monsters that can be summoned with "Agapain"
Dragon Xyz Monsters that can be summoned with "Agapain"
Dragon Link Monsters that can be summoned with "Agapain"
This page was last edited on 24 January 2019, at 23:31.